Nearly a year after the sale of storied soccer club AC Milan was first announced, and eight months after the purchase agreement was signed, a holding company controlled by former Italian Prime Minister and gross, criminal, proto-Trump Silvio Berlusconi finalized a deal with Chinese investors, represented by David Han Li (shown above). 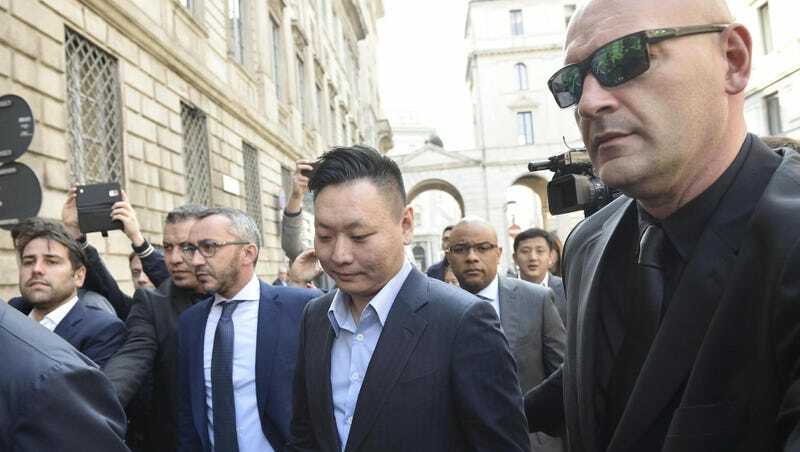 The move marks the end of Berlusconi’s 31-year reign as owner of the iconic club and increases China’s ever-expanding presence in global soccer. Since Berlusconi acquired the club in 1986, AC Milan have won eight Serie A titles and five European Cup/Champions League titles in 1989, 1990, 1994, 2003, and 2007. Their success in the early 90s under legendary coach Fabio Capello earned them the nickname “Gli Invincibili,” the Invincibles. In recent years, however, the club has failed to live up to its former glory: In the past three seasons, they’ve finished in seventh, 10th, and eighth in league play. This season, Milan currently sit in sixth, just two points ahead of their cross-town rivals, Inter. The terms of the agreement are the same disclosed in August and reflect of an aggregate evaluation of AC Milan equal to EUR 740 million, which includes the club’s indebtedness, equal to EUR 220 million as of June 30th 2016. A EUR 90 million refund for AC Milan’s running costs anticipated by Fininvest from July 1st 2016 hitherto add up to the evaluation. The buyers also confirmed their commitment to undertake significant capital increases and liquidity injections aimed at strengthening AC Milan’s financial structure. In short, the rich new owners took on all of the club’s considerable debt, compensated the old owners for months of operating costs, and have promised to funnel “significant” money into the club. China’s $3 billion European soccer spending spree was cut short by a Beijing crackdown on overseas vanity deals and the group failed to raise the funds on time, delaying closure. Elliott will provide 300 million euros in financing to the Chinese consortium, a lawyer and a source close to the matter said on Monday, and the deal is now expected to close on April 14 — eight months and two postponements after it was agreed. The AC Milan sale comes less than a year after Chinese company Suning Holdings Group bought a majority share of Inter. When that sale went through in June 2016, Suning chairman Zhang Jindong said, “Acquiring Inter Milan is part of Suning’s strategy in becoming a leader in the sports industry in the coming five years. We will make Inter more internationalised,” per ESPN. According to a UEFA report released earlier this year on financial developments in European clubs in the 2015 fiscal year, China has been leading the world in spending on foreign clubs. In the nation’s quest for global soccer power, Chinese companies and investors aren’t just shelling out to acquire foreign clubs—they’re also paying huge transfer fees to bring stars to the domestic Chinese Super League and have spent big on rights to broadcast foreign leagues like the Premier League. The purchase of a club with as much history and success as AC Milan, though, is China’s biggest move yet. The sale marks the end of a fruitful if recently frustrating era for AC Milan; for China, it could herald the beginning of another.